Wow, we have been off the blog for a while. Tracey Whitehouse and I think about it all the time. We talk about what we need to post. What we want to post. and then work, children, challenges with children, sickness, and life just get in the way. We said goodbye to some beloved staff in December. Janna McIntyre is off to Senegal very soon and this past Friday, we skyped with Patrick Frame from his new digs in Iceland’s capital city, Reykjavik. We have missed their daily presence, but are so happy for them to be having these incredible experiences. Even though our kids were suffering from a severe case of challenging behavior crammed into the project lab like sardines on the last day of a long week of no outside recess—-you could see that talking about another country with Patrick while he was sitting there, 5 hours ahead of us, in complete darkness of night, getting to ask him questions about life made more of an impact on them than any pictures or videos we could show them of a country. It made it real. It made it tangible. A good learning for us staff. 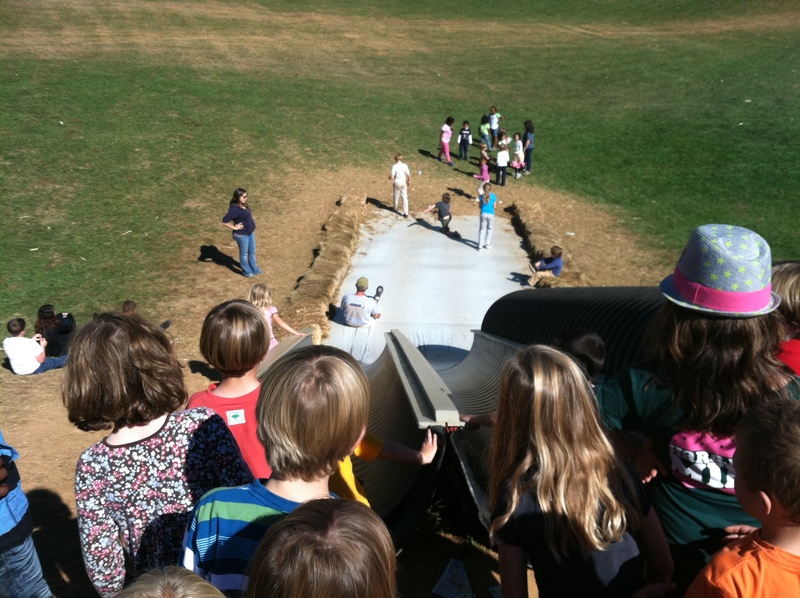 Making experiences tangible for the kids is our daily challenge. In fact, that was a large part of a 3 hour meeting that Ms. Lewis, Tracey and I had yesterday. We have kids from all socio-economic backgrounds. We are reaching some and we are light-years from others. How to plan for groups that include kids from the entire socio-economic spectrum and engage them all? Add into that mix that these are individual humans who are so much more than the sum of their socio-economic parts. Our goal is to inspire them, help them learn to make good choices-not just to satisfy us-but so that they grow up to be contributing, interesting human beings engaged in life. engaged in the world. engaged in LIVING-not existing. How do we positively contribute to their growing up process and inspire them and engage them and keep them safe AND keep our program evolving and moving forward as a whole?!?! One way is a 3 hour meeting on a beautiful Saturday. Another is the valuable resource of our teachers and staff at Dickson. We so appreciate their willingness to hold counsel in the hallway or to share strategies and plans with us. We are a stronger program because of them. We are also so appreciative of the parents of our kids. You support us, work with us and trust us to be a part of your kids’ lives. Bright IDEAS is becoming more than the sum of its parts as well. This is far from where I started this blog entry, but oh well. It’s Sunday morning and I have only had one cup of coffee. We have a lot coming up in BI. This week is anti-bullying week. We have new units of study for the weeks and months to come too. Weird science, volcanoes, Senegal, the earth, character building, water, galaxies and stars to name a few. Wow, this month has flown by!! We are in the short week between club sessions. Since the last time I posted, we have studied Samoa, storytelling and now we are on dinosaurs. Not to mention that registration for Session 2 has come and gone and new clubs start next Tuesday the 30th!! Samoa was so wonderful. We have a family from there and they kindly came and brought photos, clothing and artifacts from their time there. We learned what life is like for them, what they eat, where they live, what they study in school. Thanks to Molly and her 3 kids for sharing everything with us! Storytelling week was also wonderful. 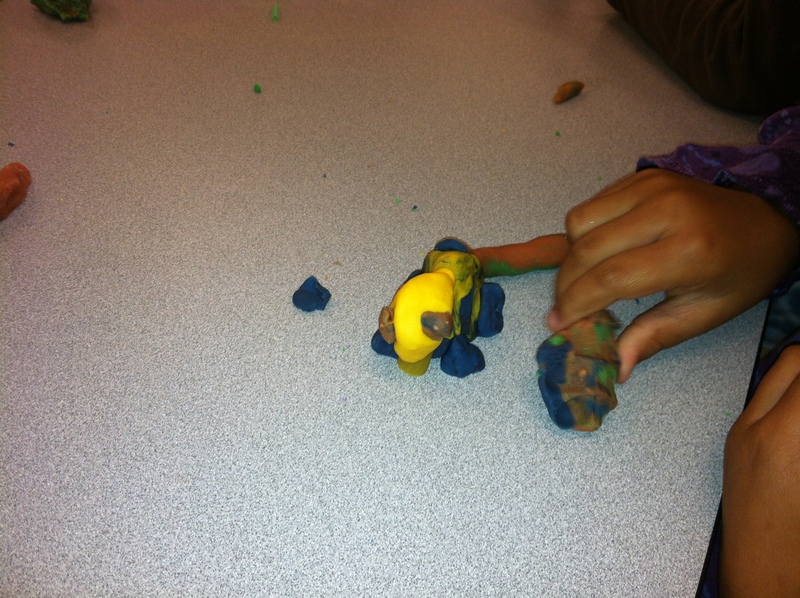 The BI kids learned the different ways we tell stories. Why we tell stories. We wrote family stories in pictures and words in the journals we made. We did story circles and created our own stories. Miss Pat from the Pack Place library came on Friday the 19th and enchanted the kids with stories. 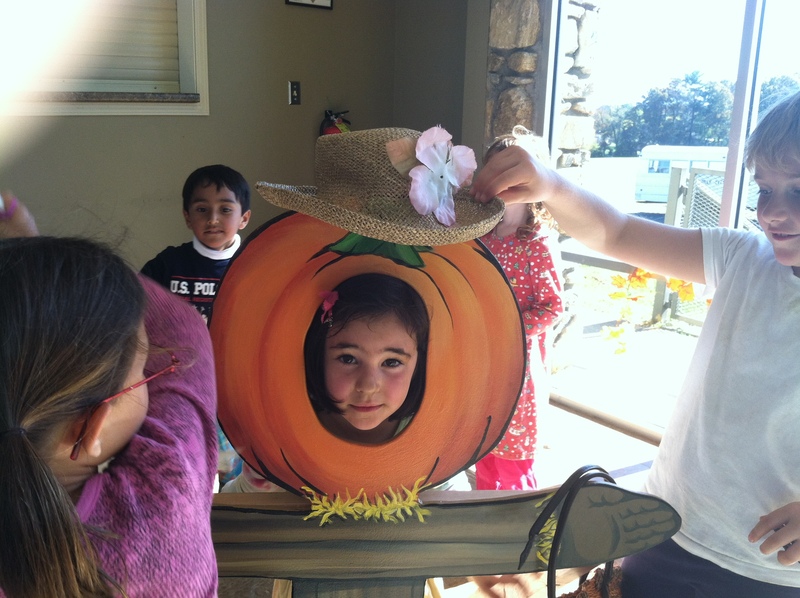 On Monday the 22nd, we took 25 kids to the Eliada Corn Maze. It was a BLAST!! 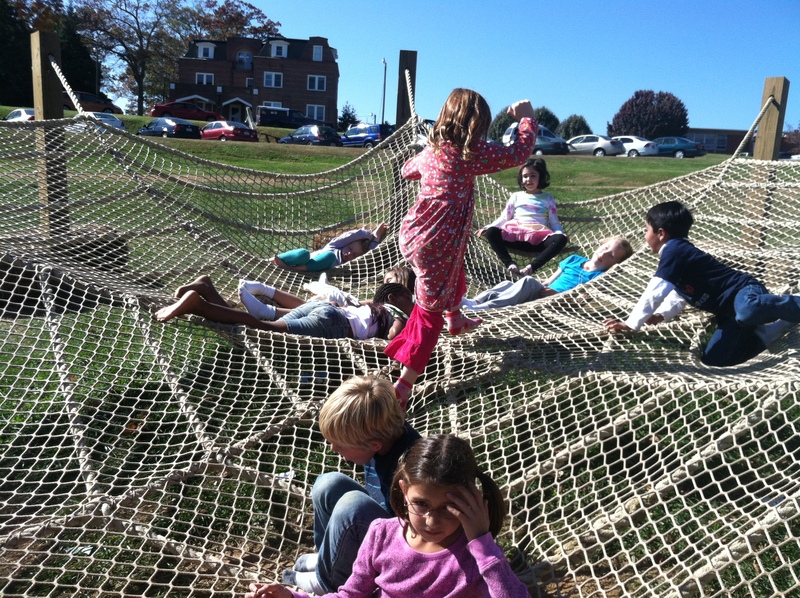 We spent 3 hours combing over the maze, relaxing in a large rope spider web, blasting corncobs out of cannons and over pumpkin scare crows. 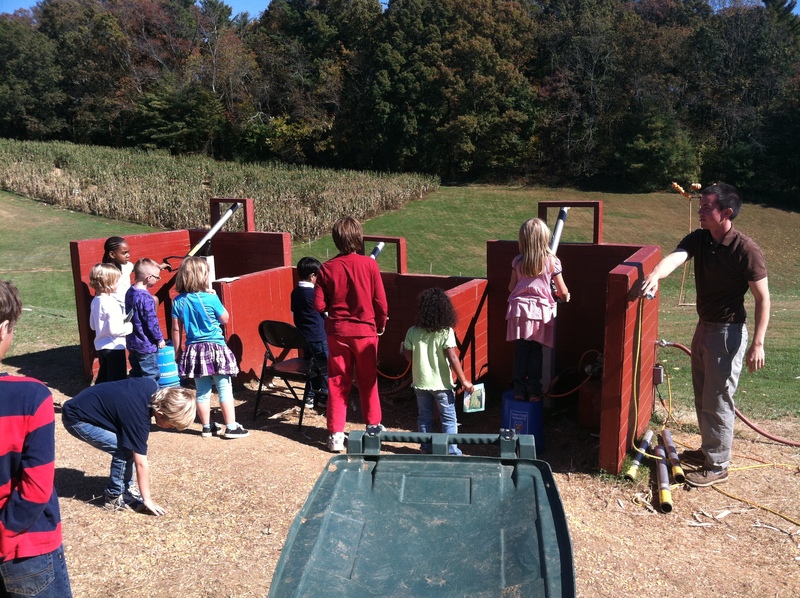 Sliding down 3 wild and fun slides, AND had a hayride in the pumpkin wagon. But before we went there, we had Ms. Cari Snodgrass working with 3 groups of kids on storytelling thru treasure maps and puppets. 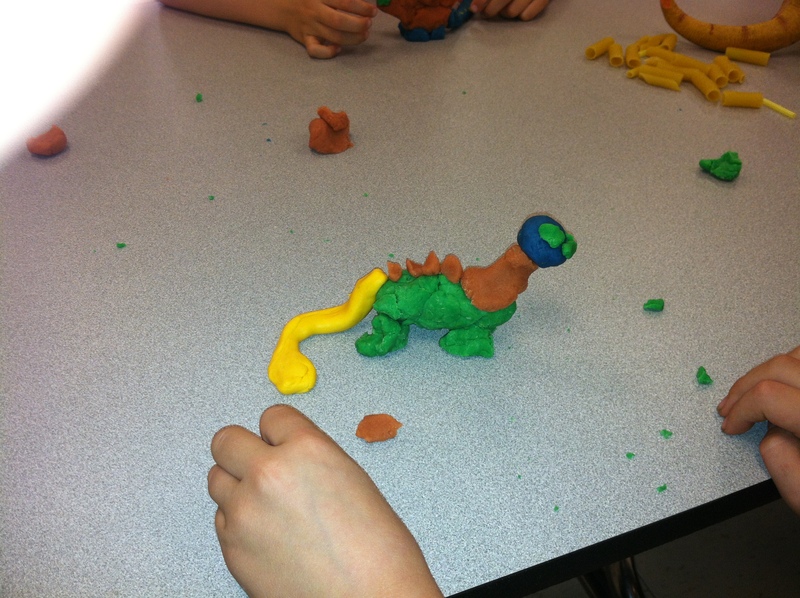 While 25 went to the corn maze, we had another group that stayed behind at school and made the playdough we needed for the dinosaurs sculpting craft. On Tuesday, we had kids working on masks with Jenn Goff. Drawing projects, games to play, fun free time in the computer lab. The list goes on and on! 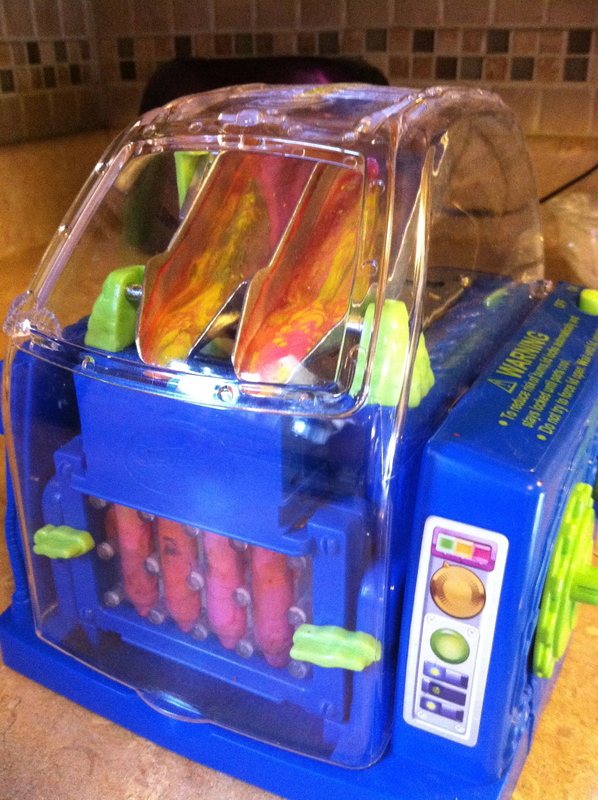 THEN, yesterday, we were on to dinosaurs! 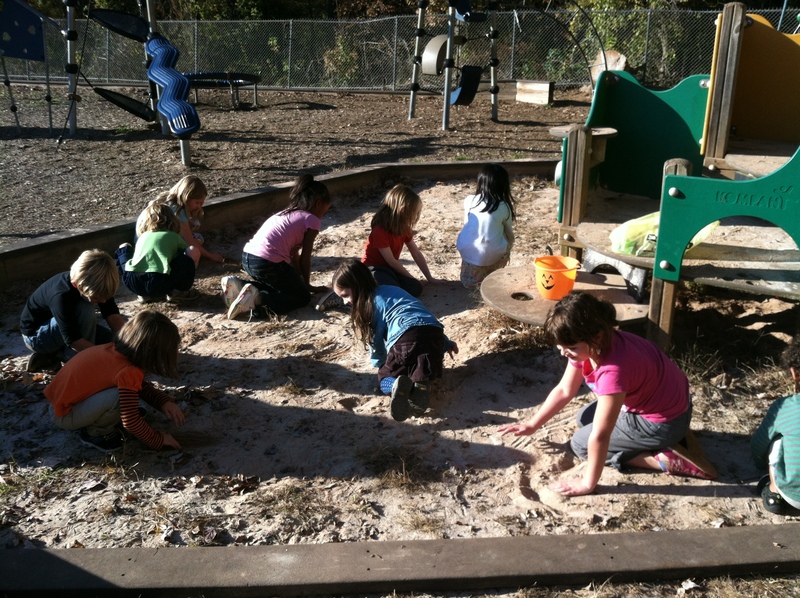 The Cousteaus crafted some really wonderful dinosaurs out of our homemade playdough and then went out to the sand pit on the big kid playground to play palientologists. We dug up ‘baby’ dinosaurs and ‘dinosaur bones’. It has been an exciting few weeks, even thought our blog has been rather quiet. Clubs next session are going to be great. And the Explorers Club is starting Session 2 by studying Transylvania and planning a Halloween party for Wednesday. It’s a busy time, but isn’t it busy with BI all the time?!?! Can you believe it is time to register for 2nd session? Registration paperwork will go out later this week and registration will begin Monday, October 15. We will be set up in the hall across from the main office, Monday-Friday October 15-19 from 7:30-8:30 am. There will be no afternoon registration times. (because we are IN Bright IDEAS every afternoon starting at 2:30 pm!) If you have any questions, come see us. We can’t wait to get started! It is going to be awesome!! I am positive that the kids who actually did go home and say that phrase to their parents were greeted with some pretty interesting looks. But how else could you possibly begin a study of Morocco than to watch the last 2 minutes of such an incredibly famous movie, a Bogie movie nonetheless, that takes place in Morocco’s most exciting and mysterious city!?!? It is cinematic history. an icon. a landmark. an institution. Of course, if you ask the kids, the video clips of the snake charmers in Marrakesh’s famous or infamous market, Djemaa el fna far outweighed a silly black and white movie. Don’t get me wrong, watching King Cobra’s ‘dance’ is pretty amazing. And all of the performers who frequent the market. Dancers, storytellers, vendors of fruits and veggies, sellers of cloth and trinkets. Jugglers. It is a circus. It is a street fair. It is a madhouse. But this staffer would rather endure a root canal than an up close and personal interaction with a snake. We also looked at some of the amazing mosques and mosaics that call Morocco home. 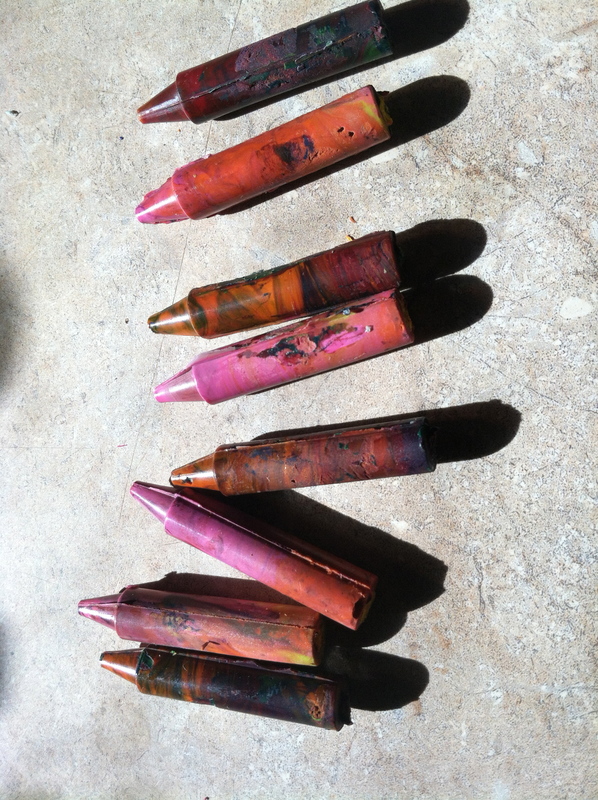 The kids made drums and attempted to cover them in personal mosaic designs. We listened to fables from Morocco, and talked about storytelling. We are going to do a unit soon on storytelling. Can’t wait for that! Again, soccer is the game of choice. They play a lot of games we play. Marbles too. Since this week is a short week, we did our foodal journey of discovery on Thursday rather than waiting until Friday. The Armstrong group (grades 4/5) made couscous with onion, red pepper, cucumber and carrots. We made mint tea as well. It was beautiful in the glass jars! 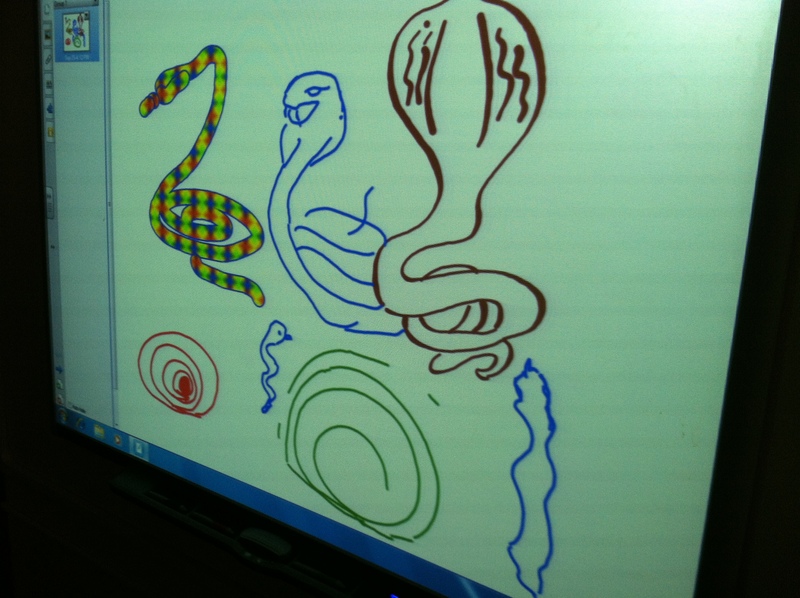 The younger kids got the chance to draw some snakes on our smartboard, while we looked at the different perspectives of seeing an object, in this case a coiled snake like the ones in Djemaa el fna. They did a great job. 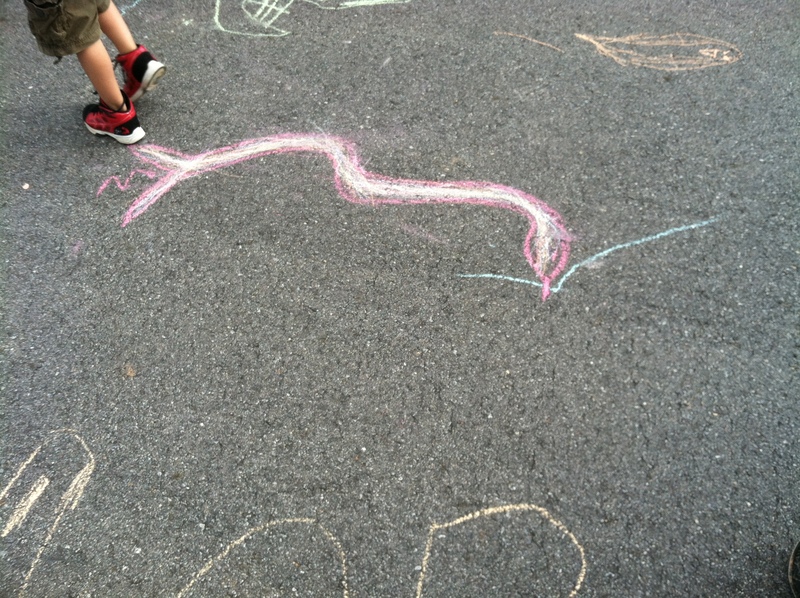 Then we practiced doing the cobra yoga pose and then they drew chalk snakes outside. 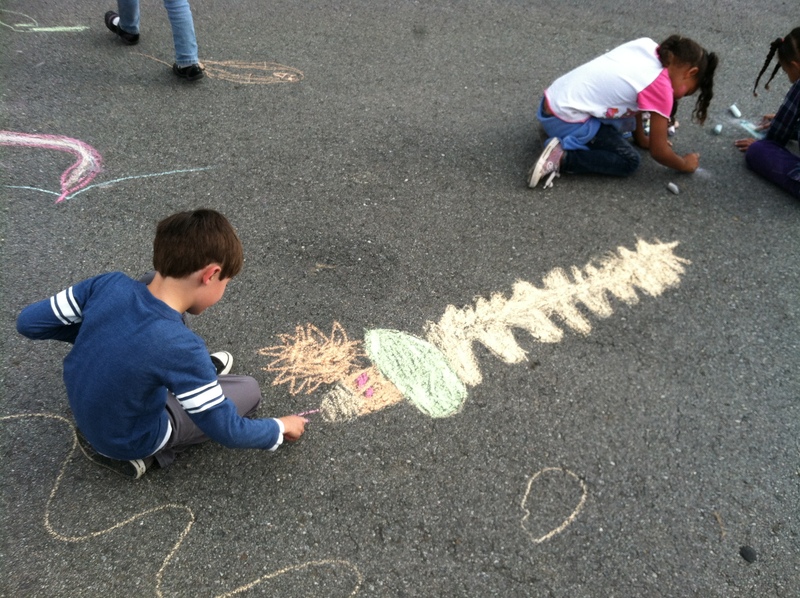 You could say do math with chalk outside on the basketball court and they would think it was the best idea ever! Enjoy the photosssssssssssss.